IDF reports force operating in area encounters rioters throwing rocks, causing them to fire in air. An incident on Saturday between Jewish residents and IDF soldiers led to a battle between the sides this morning. The IDF Spokesman said an IDF force carrying out an operational mission near Itamar in Samaria was attacked by Israeli rioters who were present, throwing rocks to the point of endangering the force. The force reacted with tear gas and riot control measures and fired into the air to keep the rioters away. Later, three suspects were arrested and taken for questioning by the Israel Police. "The IDF views with great severity the use of violence against its forces and will continue to enforce law and order in conjunction with the rest of the security forces," the IDF spokesman said. The Honenu legal aid organization assisting the detainees presents a completely different picture. Their sources say an IDF force arrived during the Sabbath to evacuate an outpost near Itamar and fired gas and even live ammunition at youths, some of them minors. According to testimonies the live fire was directed near some of the minor's heads. 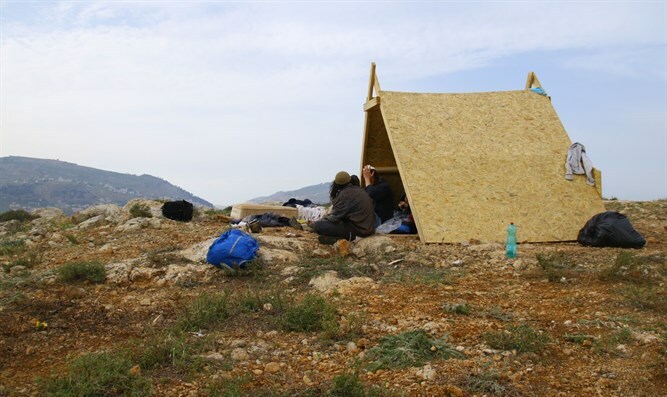 The boys established the Rosh Yosef outpost about three weeks ago, built a structure, and began living there. As the Sabbath began, an IDF force arrived under command of Samaria Brigade Commander Gilad Amit accompanied by an army bulldozer to evacuate the outpost and demolish the building, an attempt that did not succeed. During the Sabbath, the brigade commander arrived again, accompanied by another force, and for unclear reasons the Brigade Commander tried to arrest one of the youths, which included a confrontation between the force and some of the residents. During the confrontation, the soldiers threw a tear gas canister and sprayed additional gas at minors. The youths testify that at one point one of the soldiers began shooting in the air and at a certain stage did so just above the boys' heads. Following the shooting, the youths fled. Three boys who were there and did not flee were arrested. One of the boys who lives there said, "They shot at us right above our heads; one of the guys had to duck so the shots wouldn't hit him, and the soldiers shouted and cursed us horribly. The Border Police came and broke our belongings and equipment, and took our water and food. We've come to settle the Land of Israel so with G-d's help another settlement will be established here. The army's conduct won't break us," he said. The youths who were arrested were interrogated late last night evening in the Samaria region police station and will probably be brought to court in Petah Tikva during the day. Attorney Yossi Nadav, who represents the youths on behalf of Honenu, came to the police station to assist the boys. Attorney Nadav heard from the youths about the shooting incident: "My client was in an area which at some point was declared a closed military zone, there or a nearby place. My client didn't resist arrest, cooperated, and didn't flee. The shooting is very serious, and we expect the IDF to examine the matter seriously," he said.